Anyway, one of the things I found was obviously eating more fruits and vegetables, and an easy way to eat all of that is in liquid form. (If you want to debate juicing vs blending, I'm not here to do that. I have a blender therefore I blend. Plus it's super easy to clean. Also, see laziness note above.) Thankfully I stumbled upon simplegreensmoothies.com which has great two-serving recipes that are yummy, easy to follow and simple to halve. I've signed up for the July 30 day challenge where they email you recipes for the week with a shopping list, and you make one green smoothie a day for 30 days. I'm impatient though, and didn't want to wait until July so I started my own daily smoothie regimen early last week. I'm twelve days in, day I'm loving it. I haven't gone too crazy experimenting with different greens or veggie/fruit combinations so I haven't had a smoothie yet that I had to just choke down. All in all, I'm already feeling good at least about my increased fruit and veggie intake. I'm prone to hippie-leaning tendencies so I've even gone as far as adding a tablespoon of chia seeds to each smoothie. Did you know that one tablespoon has 11 grams of fiber?! No more rabbit food cereal for me in the mornings! I've also been making different/better choices during lunch and dinner which seems like progress. I'm planning on going back in 6-8 weeks to see if this one change has made much, if any, difference in my blood work numbers. For now though, I'm enjoying slurping my nutrients in the morning. 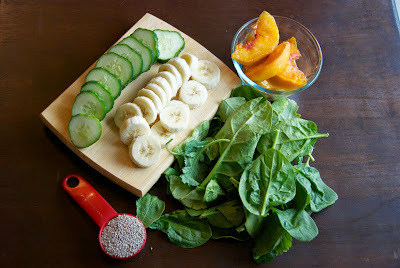 One of my current favorites is a light, refreshing green smoothie made with cucumbers and peaches. It's delicious! Blend water and greens until smooth. Add other ingredients and blend. Enjoy! So after a year-long hiatus from blogging I guess I have a bit of catching up to do. If you read Part One, Two, or Three, you might have been wondering what happened. Well, I didn't get in, not for the fall of 2013 at least - I ended up waitlisted at every school at which I interviewed. There was a chance I could have been accepted in May or early June, but since the Texas application opens in early May (and AMCAS in early June) I decided to go ahead and reapply. If I got accepted I'd only be set back a few hundred dollars, and if I didn't get accepted at least I'd have my application in early for the next go around. Writing this a year after the fact, I'm able to gloss over how difficult it was not to get accepted the first go around. Many tears were shed to say the least. This process has shown me how rough waiting can be and how important it is to keep moving forward. Thankfully I'd spent my first application year volunteering and shadowing - things I wasn't really able to put on my 2013 application since I'd worked nonstop up until applying. I was, however, able to bolster my 2014 application and interviews by having those experiences. I submitted both my TMDSAS and AMCAS applications the first day I was able, and I truly think that helped me this time around. Out of the 20 schools I applied to, I received early (August and September) interviews to three schools, two in Texas and one in Chicago. I was fortunate enough to receive an acceptance to the school in Chicago in October - I was going somewhere to med school! I was even more fortunate to receive an acceptance to my top choice, UTH, in mid-November. I was exiting HEB when I got the email. I most definitely fell against a giant pile of fireplace wood just outside the exit and started crying - I'm that girl. :) I received one more interview after that but was able to decline since I already had the acceptance I wanted in hand. It has been a long road getting here, and I'm not sure I could be more excited/anxious/over-the-moon about starting school in two months. I have some nontrad application tips coming soon so make sure to stay tuned for that.